Fatsia japonica, common name Japanese aralia, provides tropical texture to your landscape. That coarse texture is attributed to its large (nearly a foot wide) leaves that are deeply lobed (maple leaf shaped). This shade-loving plant performs well in moist (not soggy) locations. Upright stems originate near ground level usually near the base of older stems. The stems grow to about eight feet tall before bending toward the ground under their own weight. Even though the foliage of this species is enough to make you want it in your own garden, you will absolutely fall in love with its blooms. Upright clusters of showy, creamy white flowers begin to appear in fall. These little snowballs provide wonderful color to your garden. The shiny, black fruits appear in winter and are prominent for several weeks. The fruit are know to attract birds to the landscape. 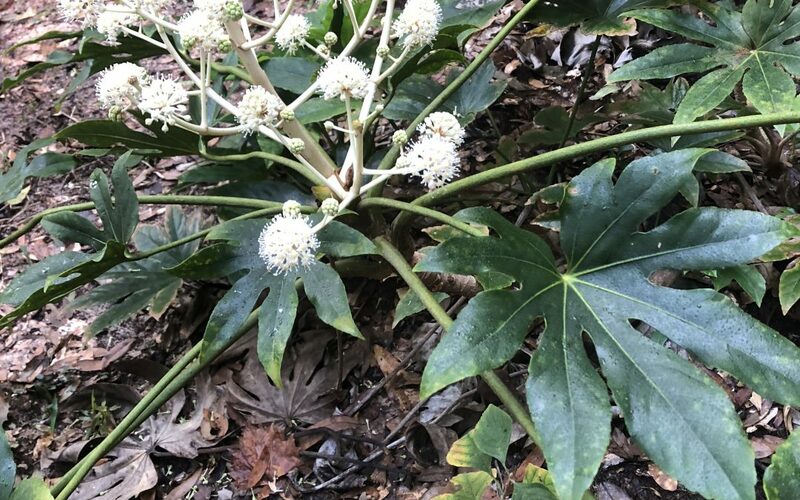 Fatsia japonica thrives in the shade in slightly acidic, nutrient-rich, moist soil. Older stems become leggy and can be cut back to encourage branching. 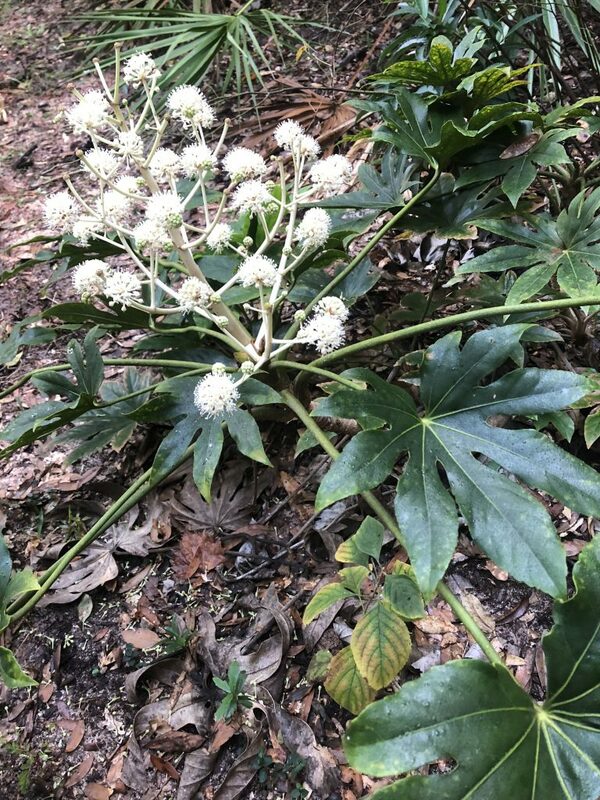 In the right place, Fatsia japonica is low-maintenance and not typically bothered by pests. It is also known to perform well in coastal landscapes. It fits well in entryways, in containers, or in mass plantings spaced three feet apart. 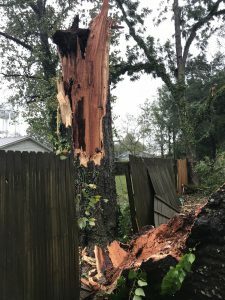 A few months ago I visited a property that had been renovated to clean up some limbs that were in danger of falling on the house. Pruning tree limbs that are in danger of hitting a structure is always a good idea, but it’s important to look at the impacts this practice may have on the rest of a landscape. Any time the light profile of a landscape is changed, current and future plant selection must be considered. One often seen example occurs when trees grow to full size and shade out the lush lawn that’s underneath. However, in this case, removal of limbs allowed more light to shine on some beautiful, old camellia bushes. 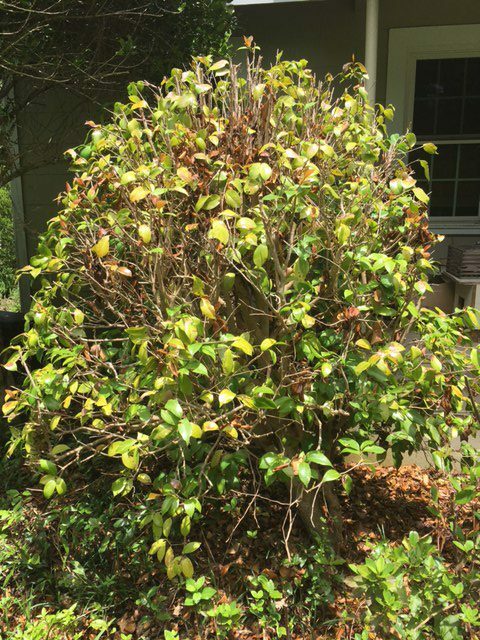 As mentioned above, the property in question was visited to diagnose sick camellia bushes. Upon further inspection of the property, asking about recent changes to the landscape, and inspecting the bushes, it was clear that the camellias were receiving too much sunlight. 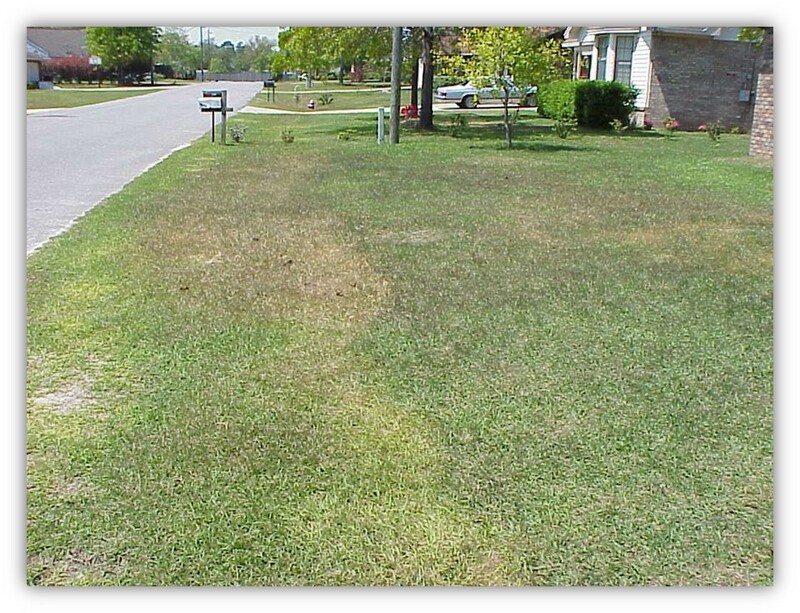 Sunlight damage was expressed by large brown sunscald spots on the yellowing leaves. The camellias had also been pruned incorrectly. 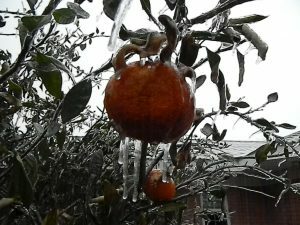 Camellias require minimal pruning. They are normally pruned to control size or promote a tree form structure if desired. Any pruning should be done before flower buds form in late summer. The best solution in this scenario was to dig up the affected camellias and move them to a location with more shade. Sun loving shrubs were suggested as options to replace the camellia bushes. It’s important to note that Camellia sasanqua cultivars are usually more tolerant of sunlight than Camellia japonica cultivars. 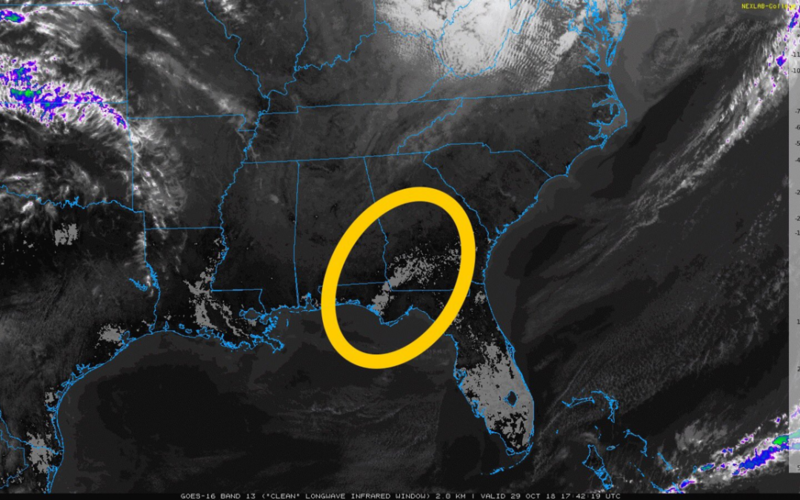 The recommendations were based on the Florida Friendly Landscaping principle of “Right Plant, Right Place”. 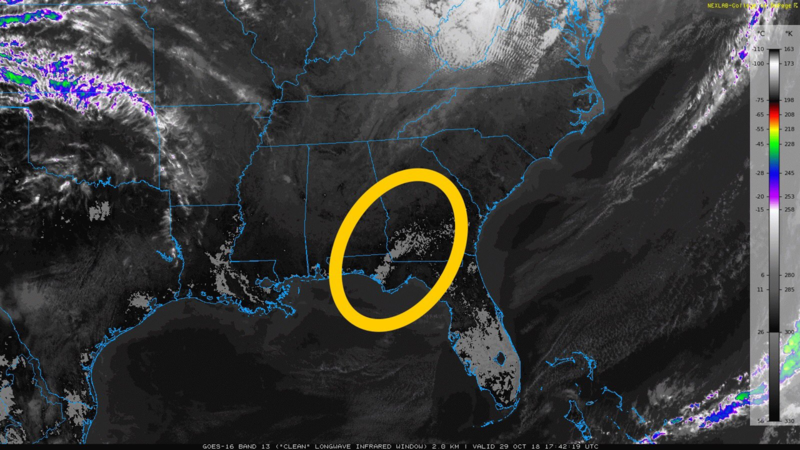 If you’re trying to find the right plants for you own yard, then you should check out the Florida Friendly Landscaping Interactive Plant Database. The database gives you plant selection options for each area of your yard based on location in the state, plant type, and soil and light conditions. How Did I Get Rust On My Blueberries? Normally we think of rust as something that deteriorates metal, but a number of different fungal rusts can affect plants in the garden. 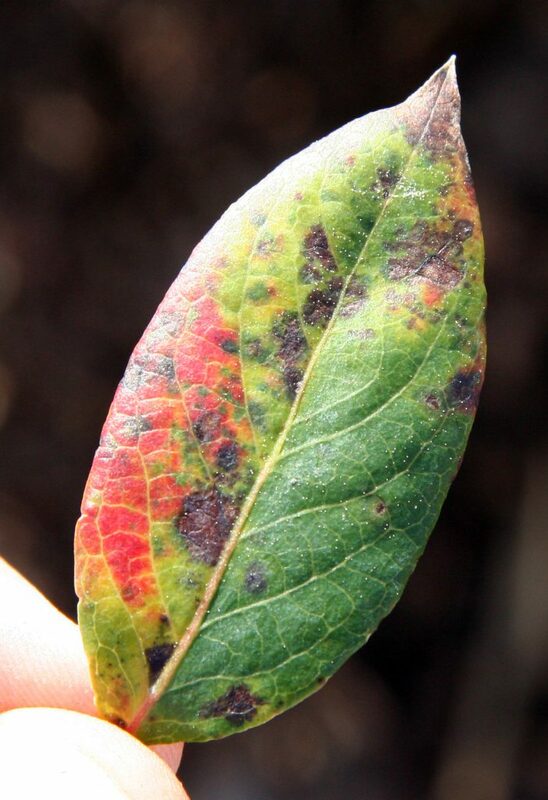 Rust disease can affect corn plants, cedar trees, and even blueberry bushes. Just like the broad range of plant species that can be plagued by rust, there are a number of species of rust fungal spores floating around and ready to infest your garden. This article will focus on leaf rust of blueberry. Blueberry leaf rust on the top of a leaf. 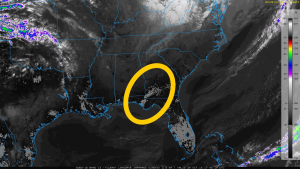 Photo Credit: Philip Harmon, University of Florida/IFAS Extension. 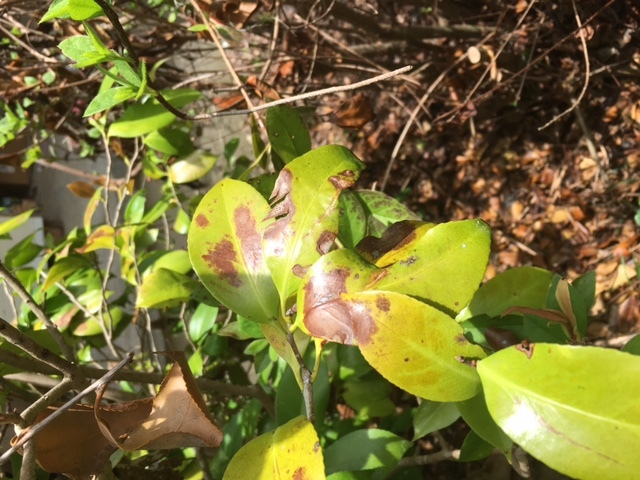 Leaf rust of blueberry in Florida is caused by the fungus Pucciniastrum vaccinii. Although the common name of the disease is “leaf rust”, the disease can also infect the stems and fruit of blueberry plants. The disease causes small, round spots visible on the tops of leaves. Spots will multiply and the leaves will eventually yellow and fall off. Young stems and green fruit can also become infected as the disease progresses. 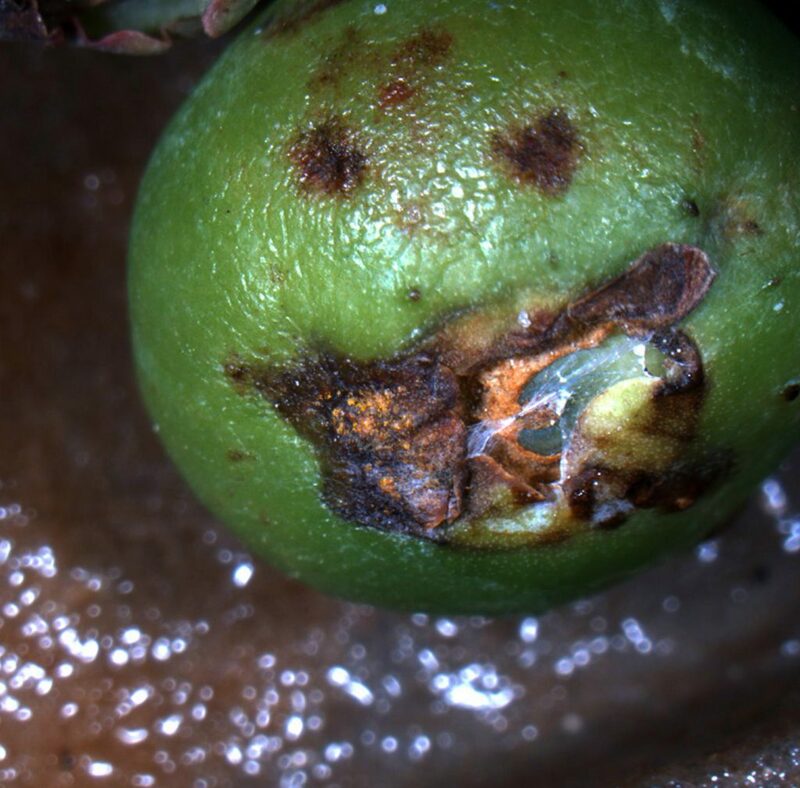 Bright orange lesions will form on stems and fruit as the thousands of microscopic spores conjoin. The clusters of spores are easily wiped or washed off of plant material. When spores dry out, they become airborne and can be transferred to nearby plants. The rust fungus thrives in hot, humid, wet conditions. A number of cultural practices can be adopted to reduce disease progression and survival. Disease persistence can be reduced by limiting the amount of water that contacts the plant leaves. Water the base of plants or install drip irrigation for your bushes rather than watering from overhead. If overhead irrigation is the only option, then water plants in the morning rather than in the evening. This allows the leaves to dry out over the course of the day. 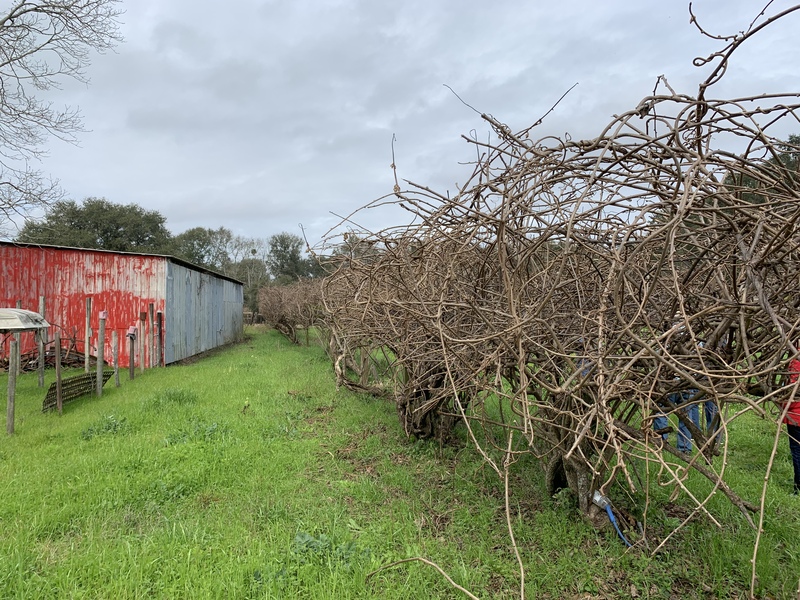 Removal of approximately 25% of the oldest canes in late winter before spring growth begins will stimulate the production of new canes and should result in plants with canes of different ages and will provide a good mix of vigorous branching and fruit production. 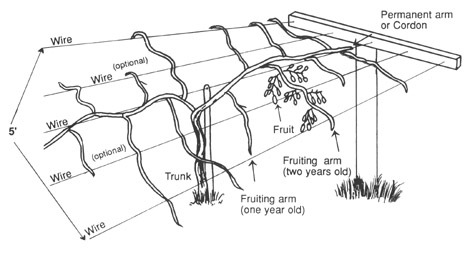 Moderate summer pruning can also improve yield and shoot growth. When pruning, cut out vigorous shoots that are growing well beyond the desired canopy height and are in the interior portion of the bush. This will promote a more open growth habit and help with air circulation on the remaining plant material. Some vigorous canes developing from the ground and growing on the outside of the bush can be topped to stimulate branching and flower bud formation. Pine bark mulch helps with establishment of young plants and helps keep soil pH low in existing plantings. A layer of aged pine bark 3 inches deep extending about 2 feet out from the plants will provide a good growing medium for surface feeder roots. Pine straw can be used if pine bark is unavailable. Mulch also moderates soil temperature, helps keep weeds at bay, and adds organic matter to the soil. Make sure to keep mulch raked back about three inches away from the plant canes to provide good air circulation to the roots. Hopefully this article has given you some tips to have a good blueberry crop for years to come. For more information on growing blueberries in Florida, please visit the University of Florida/IFAS EDIS Publication: Blueberry Gardener’s Guide.